Visit Boot Barn, online at BootBarn.com, for western wear galore. Boot Barn specializes in western boots, clothing, accessories, and hats. Whether you're a cowboy or cowgirl, or someone who just loves the western wear look, Boot Barn is your best resource. Boot Barn carries western belt buckles, great felt and straw hats, and the denim and cowboy boots that are essential to the western look. 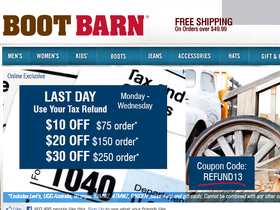 Be sure to check RetailSteal.com for the latest Boot Barn coupons, Boot Barn promotions, and Boot Barn discount codes. Boot Barn offers free shipping on orders of $49.99 or more and ships domestically and internationally. Make returns within 60 days of receipt for refund. Get free shipping on all boot orders at BootBarn.com. Click link to shop. Save up to 80% on sale boots, apparel, accessories, and hats at BootBarn.com. Click link and save. Save $85 on select Cody James and Shayanne Apparel at Boot Barn. Click link for savings. Check out the Deal of the Day at BootBarn.com and save up to $40. Click link to shop. Shop at Boot Barn and save up to 50% on Shyanne apparel. Click link to shop.